What Remains to Be Answered in Political Economy? 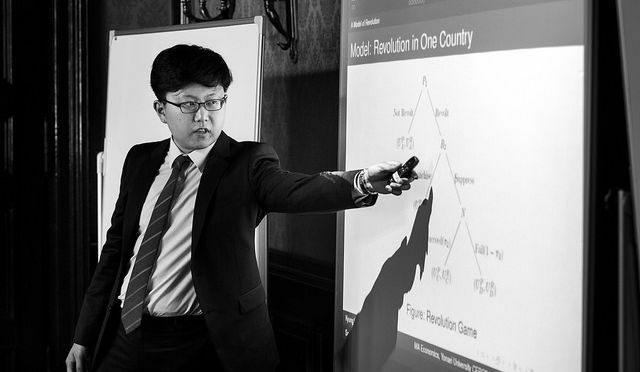 Read our next interview with the he New Economic Talent competition finalist: this time Kyung Woong Koh (Yonsei University), who was awarded a second place (jointly with Sebastian Beug from the Humboldt University of Berlin) for his paper “Snowballs and Dominoes: Towards a General Theory of Democratization Waves”. Personally, what drives you to study economics? I was an undergraduate economics student at Yonsei University, but I wasn’t that serious about pursuing a career in academia. Later, I was writing a paper on social movements and income inequality for an upcoming conference, and I came across an interesting book by Professors Daron Acemoglu and James A. Robinson, Economic Origins of Dictatorship and Democracy. They explain revolutions and coup d’états, some of the most complicated social movements that change the histories of entire countries and continents, into a simple game-theoretical model with income inequality as the main variable of analysis. It was electrifying. Part of the power of economics is that we can have quantitative explanations of some of the most complex economic and sociopolitical phenomena. That solidified my will to study economics, and in particular political economy. As for political economy, I would say that work remains to be done on incorporating political transitions or other major reforms or “shocks” into standard macroeconomic models. Such an endeavor remains both an intellectual challenge in economic forecasting and a real concern for the future of many people in many countries. I wish to be able to shed light on these matters, and that drove and still drives me to study economics. Who has inspired you the most during your studies? Continuing from the previous question, I was much inspired by Professor Daron Acemoglu’s work on political transitions in my earlier working papers concerning economic factors of the democratization process. His well-known ability to take on heavy workloads inspired me to take on such a heavily research-oriented agenda even as a student. He is also very polite and helpful in his concise emails, which is always a great inspiration to any beginning student in economics. Having said that, I also look at the economic effects of political forces not just in dictatorships, but in democracies as well. As a result, I became very interested in political business cycles as well. Prominent researchers in these areas, such as Professors William Nordhaus and Alberto Alesina, also have had a huge effect on my research. What is the most important thing about choosing the right topic for a thesis? I would say a strong interest in any field really helps in choosing the right topic. Let me explain why. A thesis is something that the graduating student will spend a long time writing. More importantly, I find that a large part of economics research (or indeed, all original research) comes from looking at how a certain question has already been answered, and what remains to be answered. Either way, searching for a thesis topic requires a lot of reading the previous literature. My senior thesis, “Snowballs and Dominoes: Towards a General Theory of Democratization Waves”, was inspired by discussions at the 2016 IPSA World Congress. I had previously heard about the concept of democratization waves, the idea that sociopolitical movements towards democratization occur in close succession across multiple countries (the Eastern European revolutions of 1989 and the Arab Spring in the early 2010s being the most prominent examples). I think it required me to read many of the conference papers and at least five different books on democratization waves before I realized that all of these articles and books were missing a theoretical explanation for democratization waves. There were plenty of historical explanations for why the 1970s and 1980s saw many democratizations, such as Mikhail Gorbachev’s perestroika or the Tiananmen Square protests. But they didn’t explain why, in general, one democratization would lead to another in the next country, and so on (hence the attempt “towards a general theory”). I thought I could perhaps fill in that vacuum in the literature. So I wrote. Is there any skill that you find very useful for your economic research, but which you learned completely elsewhere (in a different field)? Of course, there are all the usual skills such as mathematical understanding and computer programming that are supposed to be in every serious economist’s toolkit. Additionally, every economist talks about the importance of empirical research nowadays, using econometric methods to test theories. That being said, empirical research is ultimately fueled by data, so I am somewhat surprised by the lack of emphasis on looking at how data is made in economics education. I think coding, as the term is used in the wider social sciences, is going to become extremely important in future economics research and education. Coding here refers to the process of transforming quantitative and qualitative data, usually into formats easily usable for econometric analysis, like panel data. This is especially true in political economy, a field in which I have great personal interest. If I am to measure, say, social unrest in a particular political regime, I need to find a way to quantify media reports of protests or the number of Twitter posts against a certain government regime. I need to be able to create, in effect, panel data for analyzing such phenomena. But that requires some serious thought on how to quantify such data in the first place. It also requires serious thought on the part of the data user, and I go through this process every time I have to do research using data that quantify the level or extent of democracy in a certain regime (What is democracy? How do we recognize it when we see it?). Now, analyzing and interpreting such phenomena is something that historians and political scientists have been doing for centuries. For sure, many of them are not as quantitative as economists, who tend to use that fact to argue for the superiority of economics over other social sciences (although even this is changing nowadays). I used to think this way too. Then I worked as a teaching and research assistant for a history professor for one year. I now know that academics in history and political science are very concerned about the processes in which historical data are produced as much as economists are. It’s just not as numerical as in economics, but there is an insight that gets lost in the sparse conversations between the disciplines. What are you looking forward to the most in the near future? I am obviously looking forward to the 2018-19 PhD admission process, which will determine which PhD program I will study on. But joking aside, I am also looking into future elections in democracies, both free and partially free (to use the Freedom House terminology). Recent studies in political economy, both theoretical and empirical, would look at economic inequality as a major factor. Of course, political economy can only arise from differences in economic interests, of which economic inequality is a huge factor. We as economists and students of economics are always concerned about populist forces. So how do we prevent populism from tearing apart democratic checks and balances? How do politicians redress valid concerns of economic inequality and unemployment? I believe one responsibility of political economists is to answer how we can reform and design political systems that can devise and promote better economic policies. I am also looking into news on North Korea. One of the key goals of any South (and I dare to say, North) Korean government, since the end of the Korean War in 1953, has been the reunification of the two Koreas. Now, the military option is definitely infeasible at South Korea’s current level of economic development, which is why the diplomatic and economic approach to raising North Korean living standards to South Korean ones is crucial. If there is ever going to be a reunion of the two countries, we do not want it to fall apart again due to redistributional pressures, economic uncertainty, and the resulting discontent from both Koreas. That’s why (as of July 2018) the recent détente and thawing of relations between South and North Korea becomes important in determining which initial conditions we will be given towards the reunification process. Thank you, Kyung Woong, for your time. We wish you all the best for all your future projects!